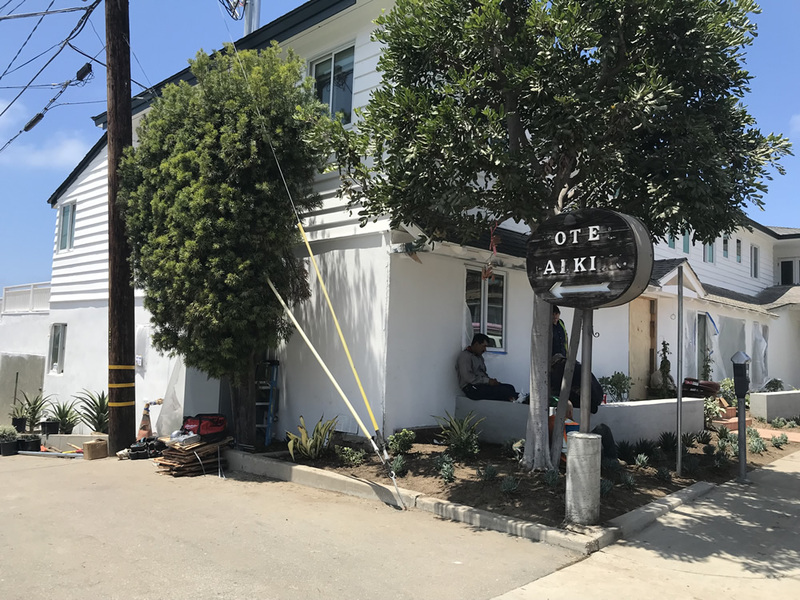 Painted in a contemporary palette of bright white bordered by black trim, the former Laguna Beach Motor Inn expects to open its doors in August as Hotel Joaquin, the newest project of the Makarechian family. Workers take a lunch break from installing landscaping around the soon to be open boutique Hotel Joaquin, at Coast Highway and Fairview St.
Hotel Joaquin is part of Auric Road, formerly Makar Properties of Beverly Hills, which owns two other boutique hotel properties – Korakia Pensione in Palm Springs and Lone Mountain Ranch in Big Sky, Mont., — also recent acquisitions by the family business. Auric Road properties seem intended to appeal to the globetrotting millennial population that shuns chain hotels for chic environs with personal amenities like wine tastings, on-site spas, wifi wired work spaces and high thread-count bedding, suggests Skift, a website tracking travel industry trends. With its cove-filled coastline alluring visitors for a more than a century, Laguna now attracts 6.3 million of them, 37 percent of whom arrive by car for a weekend. They inject $556 million into the local economy and support 5,000 jobs, said a 2016 survey by Visit Laguna Beach, the city’s promotion arm. To tap this built-in market, Makar Properties paid $7.2 million for the decades old 23-room Coast Highway property in June 2016, according to Alan Reay, of Atlas Hospitality Group, a hotel broker based in Irvine. City building records show another $1.3 million was spent on a makeover, which began last November and goes beyond room upgrades to include reconfiguring the hotel lobby with a bar for guests. Rates have yet to be posted. Guest rooms border an internal courtyard that opens toward a pool. They were updated with new bathroom fixtures, flooring and furnishings under the design influence of Robert McKinley, according to Hospitality Design, a commercial interior design publication. McKinley is known for the Surf Lodge in Montauk, N.Y.
To reinforce a sense of escape from the routine, the rooms are without televisions but equipped with record players and selected soundtracks, the publication said in a July 2 article. For divers, the hotel is walking distance to one of Laguna’s favorite snorkel spots, Shaw’s Cove. Hotelier Paul Makarechian envisions the property as a blend of St. Barth’s island vibe meets Euro flair that remains rooted in beach culture, says a statement from the company. He did not respond to an interview request. And the Makarechians so far have shown disinterest in cultivating ties to the town. Outreach efforts by Visit Laguna Beach have gone unreturned, said executive director Ashley Johnson. In the past 28 years only two new hotels have opened their doors in Laguna Beach, the Montage resort in 2003 and the Inn at Laguna in 1990. Makar’s purchase of the property in 2016 came at a time of peak hotel turnover locally, when five of the town’s 25 hotels changed hands, said Reay. Other deals that year included the Tides Inn, Holiday Inn, 14 West Boutique and Retreat Inn. “They seem to be focused on smaller boutique properties where there is a barrier to entry,” Reay said. After a nine-year run-up in revenue generated per room, the standard industry performance yardstick, hotel investors anticipate a slowdown ahead but continue moving towards quality assets, he said. Last year was a record breaking year for hotel development statewide and 2018 is on pace to eclipse that mark, according to an Atlas hotel development survey. Three new hotels opened this year in Orange County. Occupancy in the 1,300 rooms offered by Laguna hotels is running at 88 percent for July and at a similar rate in August, an improvement over a drop-off in guest stays during August 2017, Johnson said. Hotel Joaquin’s owners are not strangers to the area. Makar Properties developed the former St. Regis Monarch Beach resort in Dana Point and was among the luxury hotel operators hurt by contraction in the hospitality industry during the recession. “They were caught with the wrong property at the wrong time,” Reay said. Lender Citigroup seized the hotel over a loan default in 2009. Resorts that catered to wealthy travelers and the high-end corporate retreat business experienced some of the steepest declines in revenue as the recession hammered demand for business and leisure travel. Laguna’s hotel operators also experienced a steep drop off in revenue from its zenith in 2007. Using the city’s hotel bed tax as a guide, guests in 2007 tipped $8.5 million into the city treasury, the city’s second highest source of revenue after property tax. From that apex, bed taxes dipped precipitously for two years, but have continued to ascend since, according to city budget figures over the past decade. In each of the past three years, bed taxes have risen 11 percent a year and tally $11.6 million in the 2017 fiscal year, the most recent city budget figures available. Owners of permitted short-term rentals also contribute to that tally. In part because of the closure of Hotel Laguna in December, bed tax receipts are projected to increase by only 4 percent in the fiscal year that ended June 30. With a newcomer on the scene sure to charge boutique rates, that projection, like similar forecasts made in recent city budgets, seems like a conservative bet.